Remember back when science fiction wasn't all about selling toys to kids, but rather worked as a very adult way to satirize current events, and provoked existential discussions among the audience, thus making intellectuals of us all? 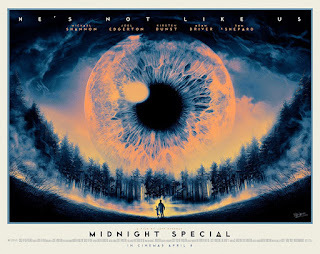 Midnight Special is one of those magical movies that doesn't strive to make things easy, but rather challenges the audience by holding back the explanations. It's a weird, wild ride, that only gets more alluring, the further you go, and even though it provides dazzling spectacles a'plenty, the most intriguing parts are still what you don't get to see. Though it received generally very positive reviews, it somehow got rather little attention, and apparently didn't even manage to make back its relatively modest budget. It feels like it was made in the wrong decade, as the clever writing, adult themes and great performances (most especially by stone-faced master minimalist Michael Shannon) would certainly have made it a huge hit had it been released in the 70s or 80s. Still, it has all the trademarks of a future cult classic, so I guess we just have to wait for someone to rediscover it and declare it a misunderstood masterpiece too far ahead of its time, in 30 years.